AccessAbility: Is Delhi ready to accommodate disabled visitors during the Commonwealth Games? As the clock is ticking for the Commonwealth Games, Delhi is seemingly gearing up fast, The government is spending $37.5 b into Delhi to make it ready for 2010 Commonwealth Games. There is tremendous spur in infrastructure development to meet the deadlines. There will be an expected inflow of 50,000 foreign visitors during this time requiring 30,000 hotel rooms to accommodate them as per Jones Lang LaSalle Hotels (JLLH), global hotel investment service firm. With less than 2 years left for the event there are presently only about 11000 rooms available with an obviously huge dearth of available accommodation. In this crunch there is neither a talk about accommodation for visitors with disabilities nor any concrete efforts are being made in this direction. If the Government was to take a count of rooms that are accessible for disabled visitors, the numbers will not be more than 80 considering that only 4 star and 5 star hotels need to be accessible. Ramps with anti-slip floors and handrails at the entrance. Wheelchair access with suitable table in at least one Restaurant. Visual & Audible Fire and Emergency alarms. Through these classifications the Ministry of Tourism require all new hotel projects to adopt facilities for physically challenged persons, since 31st December 2003 the ministry mandated all existing 4*, 5* and 5*D hotels to add facilities for physically challenged persons. As per the Ministry of Tourism’s ‘Hotel Classification System’ all 4 star, 5 star and 5 star deluxe hotels should have incorporated accessibility by January 1, 2004. 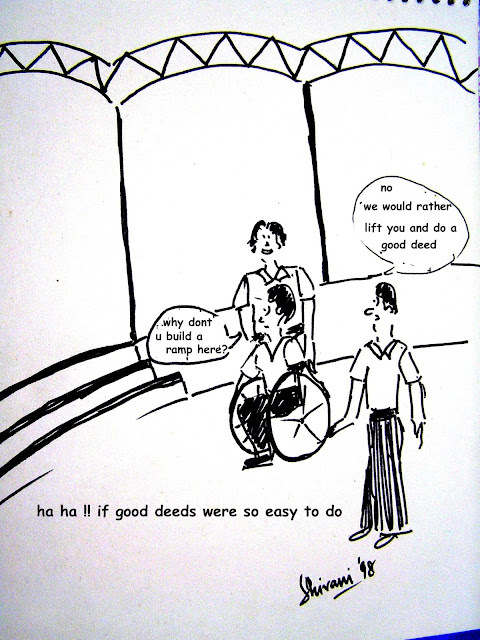 Based on a research conducted by AccessAbility, a leading Universal design consulting firm in Delhi which also makes travel guides for tourists with disabilities, in 2008 shows the reality far from being so. The research was conducted on 15 hotels in Delhi. The breakup included eleven 5 star hotels and four 4 star hotels. The study evaluated these hotels based on requirements of a wheelchair user. · 33% hotels had a guest room that could be used by a guest on a wheelchair user. · 73% had at least one restaurant that was accessible. · Out of the four 4 star hotels that were reviewed, a glaring 50% of them had absolutely no provisions for guests with disabilities. 1. Ambiguous and inadequate accessibility requirements in the present Hotel Classification System - Considering that design layout for disabled must meet some minimum space requirements, the lack of these specifications in the rating criteria opens the doors for subjective interpretation by hoteliers thereby resulting in the ‘facilities for physically challenged’ guests that are actually unusable by the very client group these facilities are supposed to cater. Also the Hotel Classification System does not include fitness and entertainment areas that are bundled into the room tariff. Additionally these classifications do not adequately address needs of people with sensory impairments. 2. Lack of accessible budget hotels – Presently the accessibility requirement of the Hotel Classification system apply only to the 4 star and 5 star hotels. Accessibility is not a requirement that budget hotels need to fulfill, forcing the majority of disabled travelers to spend their entire savings on luxury hotels. 3. Poor enforcement by the Ministry – The evaluation and auditing committee deputed by the Ministry deputes for checking against the said classification before a hotel gets its star rating have no knowledge of accessibility for people with disabilities and hence are unable to check the disabled friendliness of the various hotels. 4. The exemption mechanism not specified – There may be instances where the existing structural limitations, especially in heritage hotels, make it difficult to cater to the needs of persons with disabilities. There is no exemption mechanism specified by which hoteliers may apply for to get a waver in such instances. With the upcoming Commonwealth Games, it is not only will the requirement for regular accommodation that will multiply, but also the need for accessible accommodation will increase many fold. While people are aware and working towards filling the regular accommodation shortfall, there is no awareness or concern about accessible accommodation for visitors with disabilities. Today Delhi may boast of merely 80 hotel rooms that are supposedly accessible (based on their star ratings) to disabled travelers and that too only in the 4 star and 5 star categories. While the Ministry is planning to revise the Hotel Classification requirements but it is not clear yet if they will strengthen the accessibility component of this classification. Even if they do consider strengthning it – the time may not be enough for the industry, especially the budget hotels, to gear up the increased demand of accessible accommodation.